Latino students hear from Senator Harry Reid, the senate Mayority Leader at the Latino Youth Smmit. ther senators whoparticipated are Senator ken Salazar of Colorado, Senator Robert Melendez of new Jersey, and Senator Debbie Stabenow of Michigan. 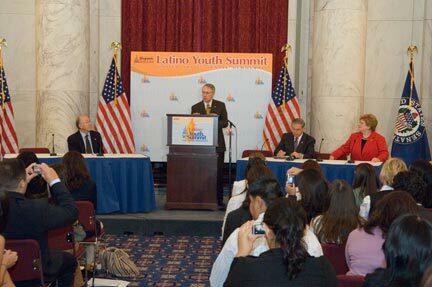 On November 16 and 17 was the First Latino Youth Summit sponsored by United States Senate Democrats. It was held in the Dirksen Building and in the Russell Building on Capitol Hill where we were discussing the participation of the Hispanic community in this country. We talked about civil rights, the Latino vote, immigration reform, and the Dream Act. Students from all over the country were there to ask questions and participate in workshops. In this event all students had the opportunity to give their opinions at the workshops given by successful Latinos working in the U.S government. All of these workshops were about our schools, homes and communities. One of the opinions given in this workshop was from Zach Serrano from the University of Colorado. “All Latino communities have to fight together for equal rights and struggle for social justice,” he said. Zach said he does this to make the country and the world a less oppressive and more equitable place where freedom and justice aren’t simple abstract concepts but are concrete realities for everyone. I was glad to participate in the Latino Youth Summit and to know what I can do to help get involved in my community. As the largest minority in this country we have a strong and big influence in the elections and the power to do something about unfairness and the injustice in our communities. Laws to help a higher education, laws such as the Dream Act that could help a thousand Latino students to finish or begin college are important. But unfortunately it didn’t pass because it didn’t get enough votes that it needed to become a law. 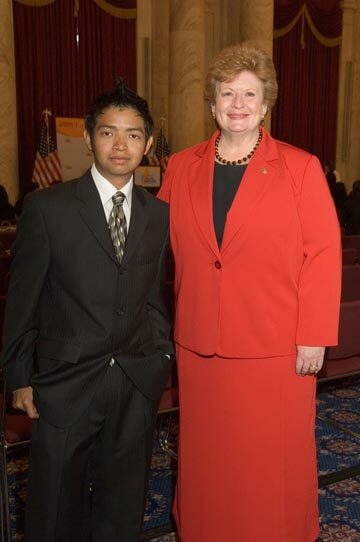 Neris Siguenza, who participated in a conference for Latinos youth sponsored by United Stated senators, is pictured with SenatorDebbie Stabenow of Michigan . The conference was sponsored by the Senate Hispanic Task Force. As a student participating in the Latino Youth Summit I learned that as a Latino living in U.S I have a voice that many don’t want to hear. My community has a voice and it has rights that many are ignoring, rights like getting a higher education, health care and the same rights as everybody else in this country. Living in this country and studying its history show me that many other races were oppressed as mine is now being oppressed by people who don’t want to understand that we are part of this great country and because of it, we make this country great. At this event some Hispanic senators answered questions from students. Some Senators were Senator Ken Salazar, Sherrod Brown, Robert Menendez and Sheldon Whitehouse. The Latino community is a community that is both dynamic and diverse. Our nation is comprised of immigrant families and multiethnic families that have strengthened and enriched our country for many generations. Some would say that this represents a challenge for the Latino community. We believe that our diversity is our greatest strength. According to information we received at the conference, as a Latino, I am part of the largest and fastest growing minority group in the country. By 2020, Hispanic youth will make up 24% of all U.S. youth (ages 5-19). 17.74% of all 20-24 years olds in the U.S are Hispanic/Latino. 9.2% of the Hispanic population in the U.S. is 20-24. So these facts mean that the political participation of Hispanics can be important. In 2004, more than 60% of the Hispanics voted democratic in presidential and congressional elections. Between 30% and 40% of Hispanics voted republican in the 2004 presidential congressional elections. Approximately 52% of Hispanics between ages of 18 and 30 registered to vote in 2000; of that, only 35% actually voted. So can you imagine how powerful the Latino vote can be if all of them vote?